The well-known research on uterine transplantation in Gothenburg is now supported by robotic surgery. This change has made operating on the donors considerably less invasive. After the technical modification, a first woman is now pregnant. "I think robotic surgery has a great future in this area," says Mats Brännström, Professor of Obstetrics and Gynecology at Sahlgrenska Academy, University of Gothenburg, and world-leading researcher in the field. 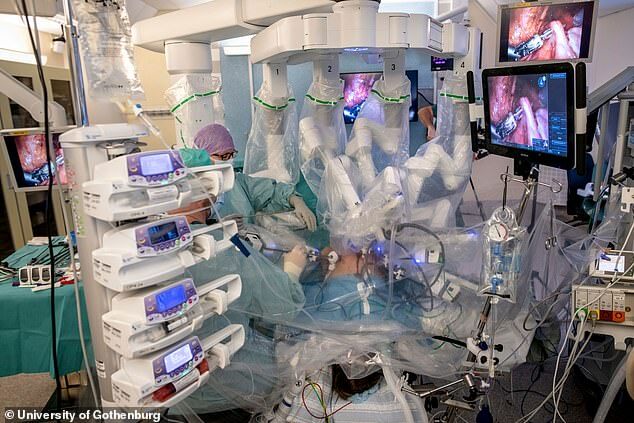 Recently, the fifth and sixth transplants of a maximum of ten were performed within the ongoing research project on uterine transplantation with robot-assisted surgery. At the same time, a woman who underwent surgery in 2017 is now pregnant, with an estimated spring delivery date. The baby will be the first born after a transplant using the new technique. So far, there have been eight births after uterine transplants in Sweden. These also took place within the scope of research at Sahlgrenska Academy, but after traditional open surgery. A hand movement from the surgeon can be converted to a millimeter-sized movement in the donor's abdomen, allowing accuracy that minimizes disturbance to both the patient and her uterus. The multi-hour operation ends removal of the uterus through an incision in the abdomen and its immediate insertion into the recipient by means of traditional open surgery. "We haven't saved as much time as we thought we would, but we gained in other ways. The donor loses less blood, the hospital stay is shorter, and the patient feels better after surgery," Brännström says. So far, the research in Gothenburg has comprised uterine transplants involving living donors where donors and recipients have been related -- often mother and daughter, but also in one case close friends. Using uteri from deceased multi-organ donors is becoming another viable option. In Brännström's view, five or six cases may be coming up in the project. If so, the recipients will be women who are already registered in the research group's studies but have not become pregnant because, for example, the proposed donor's uterus proved unsuitable. No new subjects are to be admitted. Read the original article on eurekalert.org.